I started 3 weeks ago and I think it's going fine. between the dimensions aft (giving the angle), a better match in front but opening the angle, or the best eye catching shape of the bow in conjuction with the angle. I have chosen the shape-angle combination. 10mmX50mm each. I couldn't find thinner, so I decided to either use just 2 of them or plane them to a sum of 18-20mm. I can't see your pictures. Since I built an 11N, I can't wait to see them. 2. I quit a couple years before I built mine. I towed my 9N for 5 years cruising. I loved sailing about the harbors in the late afternoon/evening with a cocktail. I was almost always the only dinghy to sail into the dock, just some kind of satisfaction in doing that. Have fun building. Oh, BTW, I see no pictures either. all good. can't wait to see the photos. 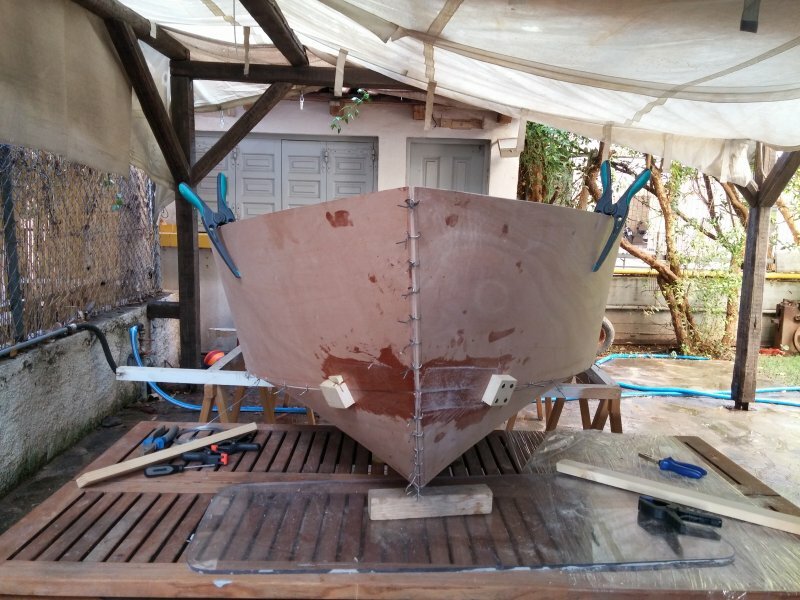 Modification of the working bench..
Any advice about the gunwales? The boat is looking great from here! Congrats on getting her folded up. Looks like you have good help too. On the gunwales I would rip them down to 30mm tall first if possible those extra 20mm in height are causing them to be much harder to bend edge wise. Two strips only for the gunwale may be OK BUT you may see some "spring back" at the nesting bulkhead when the boat is cut in half. How much I am not sure. I think that if you get them reduced to 30mm then you will be able to use all 3 strips. Remember that you do not have to do them all at once if it is too much to handle. You can glue two on together then add the thrid on top after the first two have cured. 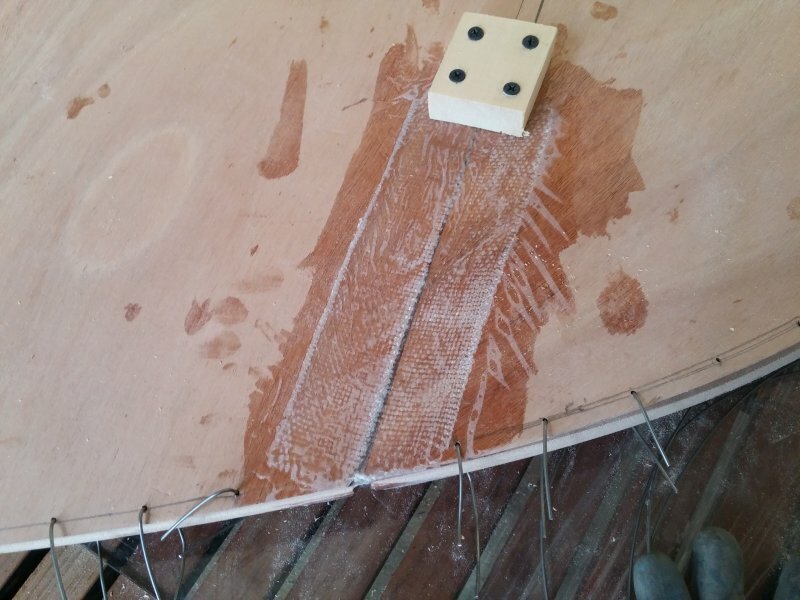 It is also much much easier to put a bevel on the strips before you glue them to the boat and do a dry fit first lining up the bevels so they mach up when you glue them on. 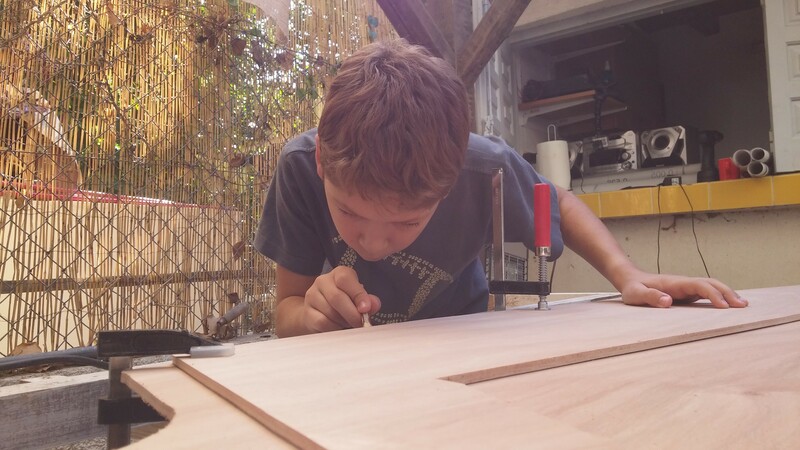 The top edges can be all uneven and are easily planed smooth down to the edge of the plywood side panel afterward. 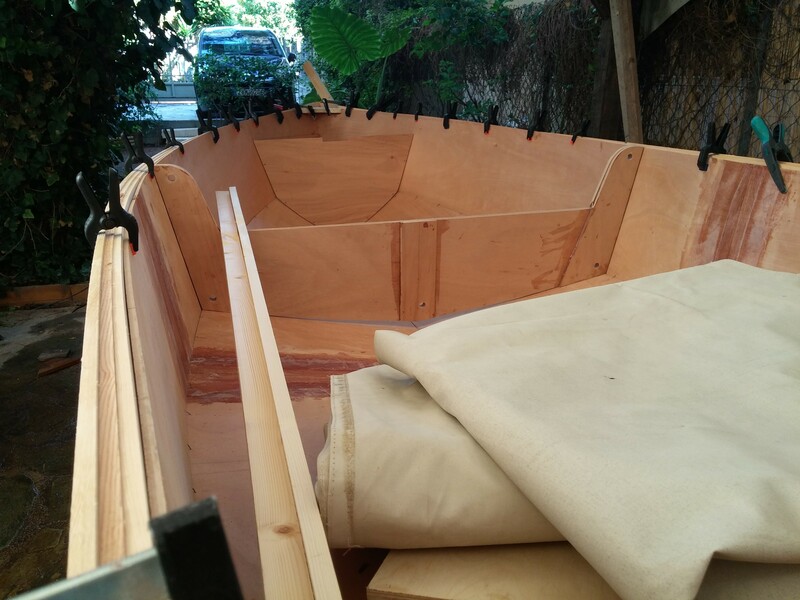 You are correct that the gunwale strips must twist to match the sheer. They have to bend with the curve of the side panel as viewed from above but also bend edge-wise to rise with the sheer line as viewed from the side. if they were round in section then they would not mind this but because the section is a rectangle the result is that the strips want to twist away from the hull especially at the lower edge and we need clamping pressure to force then not to. On another note, It looks like your nesting bulkhead has a bit of a gap right at the keel. Does this gap close if you apply pressure underneath the boat? If not I would suggest adjusting the chine wires ties to allow the bottom to flatten out a bit and then re-wire the chine in this area. And finally, don't forget to fill the holes in the nesting bulkhead with solid epoxy bushings before installing then in the boat. 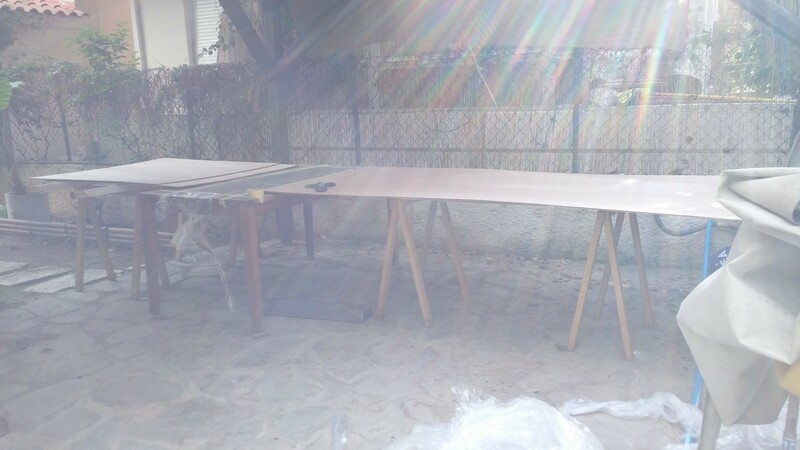 It will be much easier to do flat on the table then when they are installed. Thanx for your help Alan, I'll get back as soon as I try this one (gunwales). I don't think there would be a problem with the gap as I didn't stitch that yet, but I'll have to try this one too. One question about the gunwales. 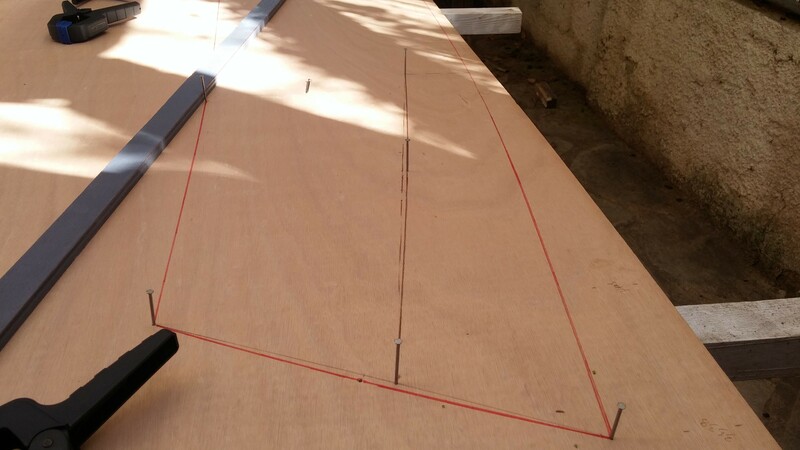 In the materials list, it said 2 pieces of 4 meter long strips 0.20x0.40. At the same time in the instructions it said 3 pieces each side. I thought I had to divide the 0.20 into three in case, let's say I want to make something artistic. Am I missing something? Ah, you are correct. It looks like there is a typo on the materials list for the S11N metric as you pointed out. 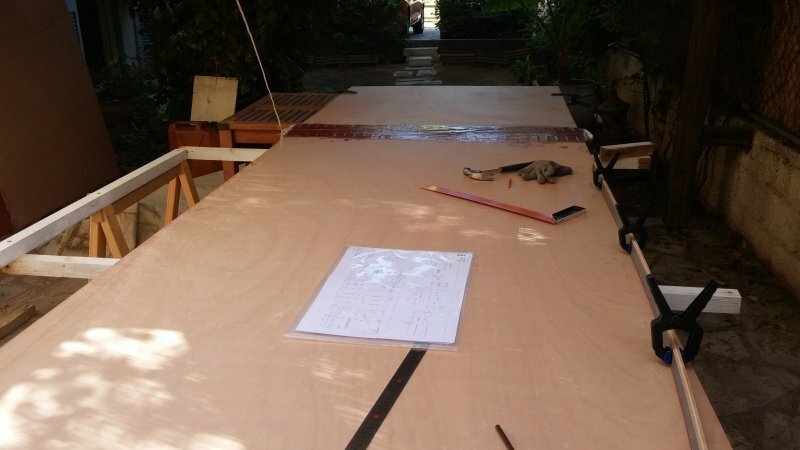 It should match the gunwale plan sheet of three strips each approximately 30mm tall x 6.5mm or 1/4" thick for laminating. At least that is what was intended. Having just corrected a typo on one of my plan sets, it's nice to see I'm not the only one that screws up every so often. I need a separate proofreader, preferably one that knows the details as well as I, how about you . . . Thank you Alan for your sincere help, I really appreciate it. I am also sorry for the mess I did here with the photos. I could see them while no one else could. Looking great man. The bulkheads, quarter knees, breast hook, and transom all look like they fit perfectly. It's amazing how long it takes to move clamps and braces around. Make sure to check for twist before filleting. My method is on my thread. I love the first time jitters associated with the butterfly step. My friend and I had hours of discussion & debate about it, before we finally “just did it”. “Oh. That was easy!” Enjoy your build. It is good to see the family getting (occasionally) involved. Thanx Thrillsbe. Yes you're right... even in occasionally but you know that is better than rarely or not at all. Butterfly is easier than it looks. The rest of it is more difficult than it looks. Now Iam stuck with the gaps here and there and the gunwales. Meanwhile it rains everyday for the last 10 days. Anyway thank you for the good words. Toothpicks... my favourite distant keeper. What do you think? Yes, you were right. It was impossible to close the gap, so I have loosen all wires and pull with a string the keel. It seems it is working. 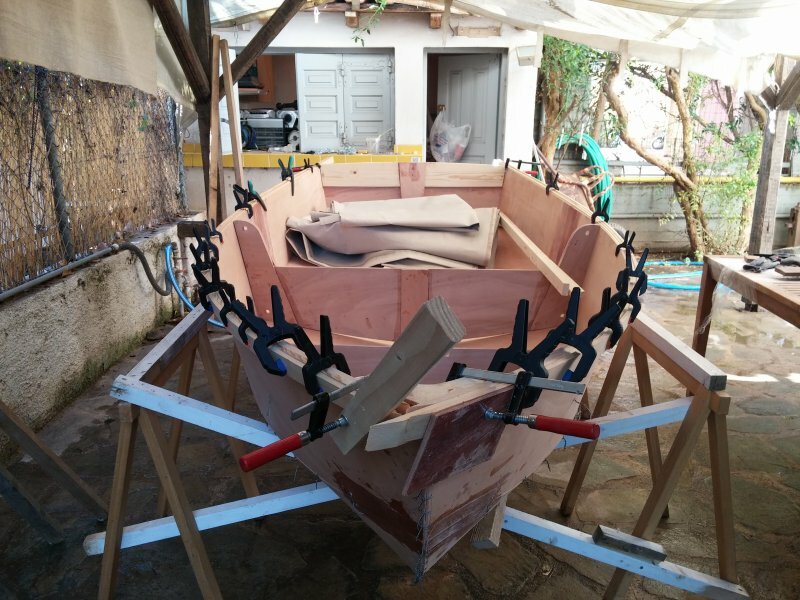 The gunwales seem to flex better after making them smaller. One question about the nesting bulkheads. What is the distance between the aft bulkhead and the transom let's say at the center inside the boat? I want just to be safe as the lines I've drawn make me feel a little anxious for the moment I'll cut the boat. The toothpick idea might work, but I know what will work really well. They sell foam sheets at arts and craft stores in different thicknesses. I scoured the house and found some in the kids art stuff. I "borrowed" a small sheet. You could also use a Styrofoam meat tray (old school) if you could find one. Make sure the thickness is greater than the saw kerf. 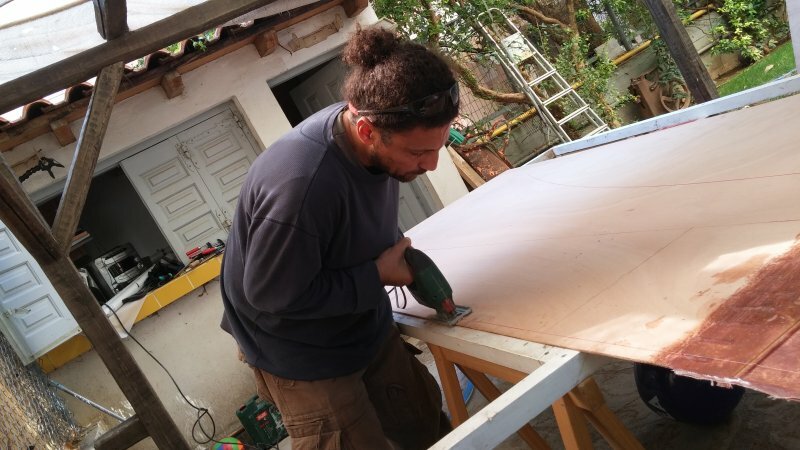 What is ideal is if ther is no resistance to cutting and you can get longer strokes with your hand saw. Otherwise the saw will want to wander into the bulkheads. 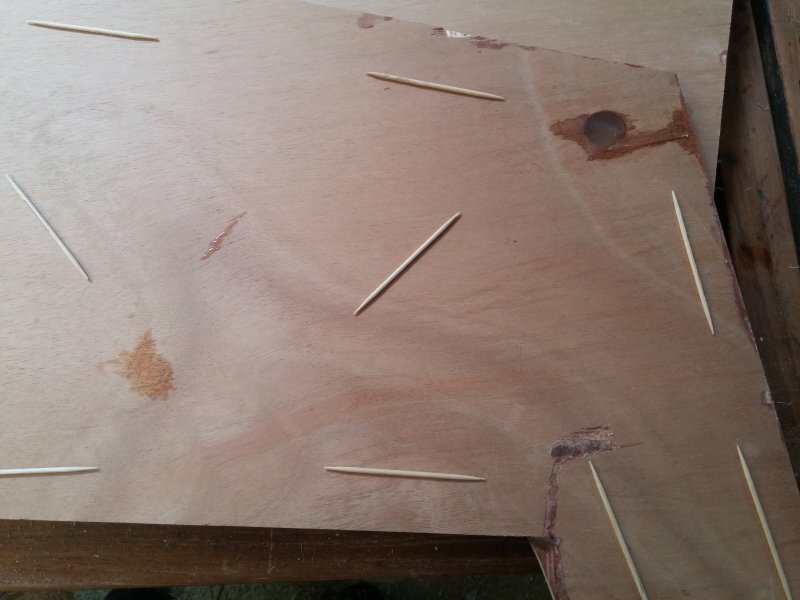 I think toothpicks are generally made of hardwood, so they would put up a bit of resistance. You can get paper backed foam sheets at any dollar store. No need to pay extra at art supply or craft stores. 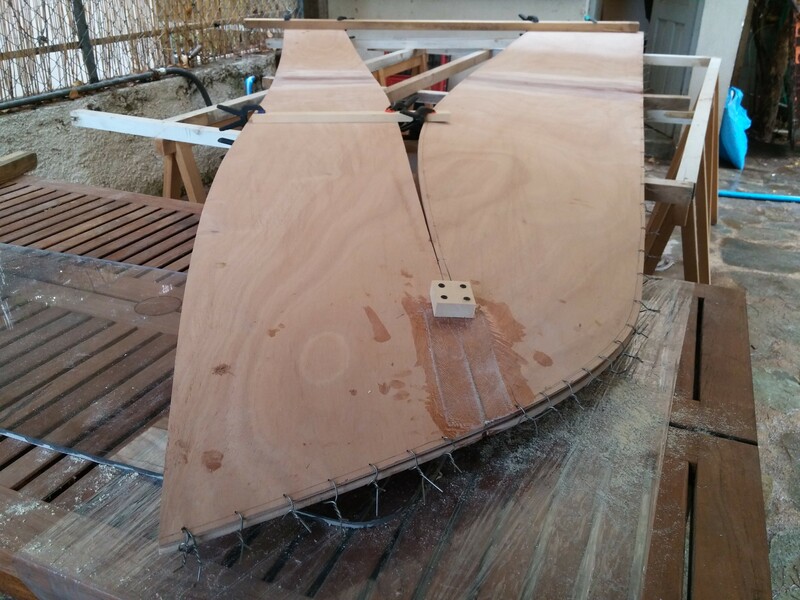 As viewed from the top (plan view) the distance from the top center outside edge of the transom to the cut plane (between the nesting bulkheads) should be 66 7/8" or 1.698m.